As this year comes to an end and we are awaiting the new year with anticipation and enthusiasm, we cannot help but look back with great fondness about having our new and repeat clients trust us to create memories for the most special day. We continue to feel blessed and humbled. For us, the most endearing aspect of this business is developing ever lasting relationships where some of our long friendships have turned into wonderful clients and then with some people who start out as being our clients have now become good friends. Here is a recap of some of our favorite events of the year. Happy New Year! Excited for what is to come in 2017! The best way for me to say goodbye to this year and welcome the New Year was to make impromptu plans to travel abroad and what better city than my all time fave city, Paris. This city holds so many amazing and precious memories for me as a teenager, then as a married couple and later on many trips with my children. Each time I visit, I find the city more beautiful and enchanting than before. We had five days in the city and it truly felt wonderful not to have any agenda or business meetings and just go with the flow. We walked the city endlessly in the 25 degree crisp and cold weather. The city was decked out with lights like a bride and shops, restaurants and boulevards were bustling with people. There were endless Christmas bazaars and little shops bearing handmade gift items. We tried all my favorite restaurants which is always a highlight of our time in Paris and a few among those were La Serre, Monsieur Blue, Manko and Le George. Our stay at the Peninsula was superb and very comfortable and the hotel roof top boasts views of Eiffel Tower, Sacre Coeur and Notre Dame. Of course your visit to Paris is not complete without visiting the lovely George Cinq and even though I missed my dear friend Jeff Leatham again in Paris but his Christmas displays had the whole town talking. Talk about creativity!!! Kudos to Jeff for making such a big name for himself, so well deserved!!! Our next stop was Budapest, one of the few cities in Europe we had not visited and the city definitely did not disappoint. Our stay was at the historical Corinthia Hotel which used to be grand hotel Budapest. The general manager who has been with the hotel since thirty years was kind enough to make time to not only meet with us, but gave us a tour of the entire hotel along with a lovely parting gift. Since this was first time for both of us in Budapest, we decided to hire a private car with driver who took us around and gave a tour of the city. The city holds a unique appeal where "Buda" sits on a hill with palatial residences and old palaces which have been turned into museums. " Pest " lies on the other side and has the hotels, banks and commercial buildings and between Buda and Pest lies Danube River. Our driver spoke flawless English and not only gave us a thorough lesson in history but pointed out several bullet ridden buildings from the wars and spoke at length about growing up as a child in communist regime. He also pointed out all the good restaurants, hotels and shops. Since my infatuation with beautiful porcelain is no secret to many and I wanted to visit Herend, he offered to take us there as well. As you can imagine for someone who has an obsession with bone china, I was just lost in the showroom and spend considerable amount of time going over new patterns and admiring old ones. We also made time to visit the Opera House and saw beautiful performance. Four Seasons Budapest was on my list to visit as well but unfortunately due to not having enough time I was not able to tour the property but that is definitely on the agenda for next trip to Budapest. I will forever cherish the thermal baths, amazing massages at the hotel and delicious cuisine prepared by world class chefs and of course our well informed driver. Now that my batteries are charged, I am ready to welcome New Year and new challenges! I had the pleasure of designing and planning Hessah and Ali's engagement party last year at the Montage Beverly Hills and recently we were honored to be part of their wedding at the magnificent Pelican Hill property. The Rotunda at Pelican Hill is such a stunning and now iconic structure, that when designing the wedding we wanted to simply enhance it and not obstruct any views of the Pacific Ocean in the background. Hessah's mom wanted to keep it very romantic in ivories and blushes so we decided to drape the rotunda in ivory and use flower predominantly ivory and blush color roses that were reminiscent of an English garden. 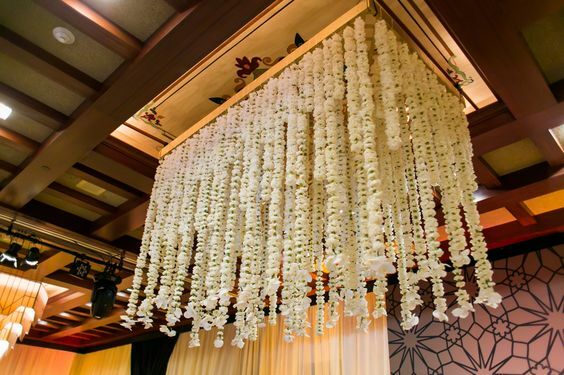 Adding cascading white phaleonopsis orchids completed the romantic, ethereal look, and of course the 3 pendant chandeliers that were hung in different heights from the rotunda added that bit of bling to capture the sunlight peaking through that day. These pictures are from a family photoshoot they did after the ceremony concluded. I absolutely adore this family and was so happy to be part of their special day! 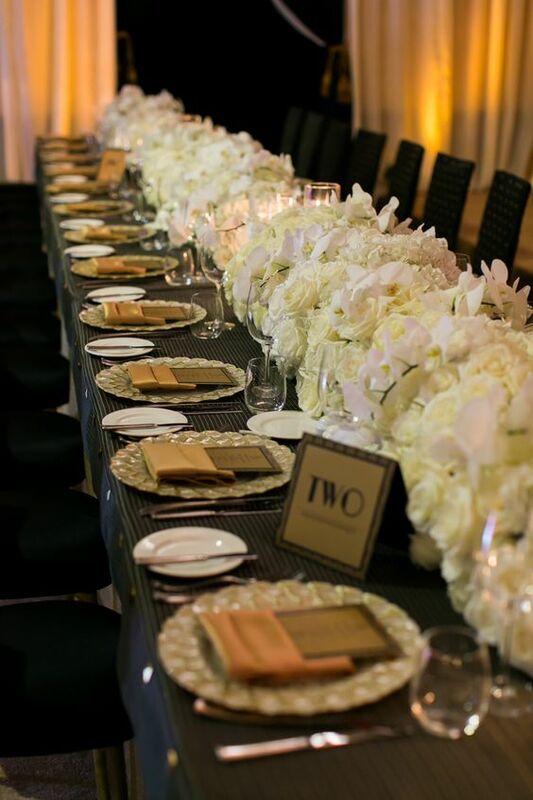 Thank you to Design/Planning: Exquisite Events Decor/Flowers: Square Root Designs Photographer: Lin and Jirsa Have an Exquisite Day! The production for the wedding started on Monday of that week. 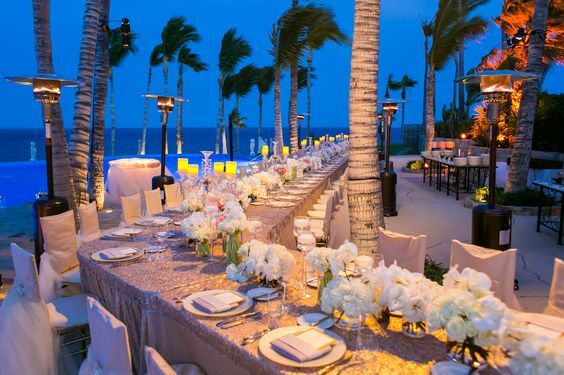 Since this main event was taking place at the client's residence there were multiple challenges of finding the perfect spot for VIP restrooms, generator and two 59 ton air conditioning units, plus vendor bathrooms that were to remain at the property for one week. In addition to that, we had to build a full satellite kitchen for the caterer. 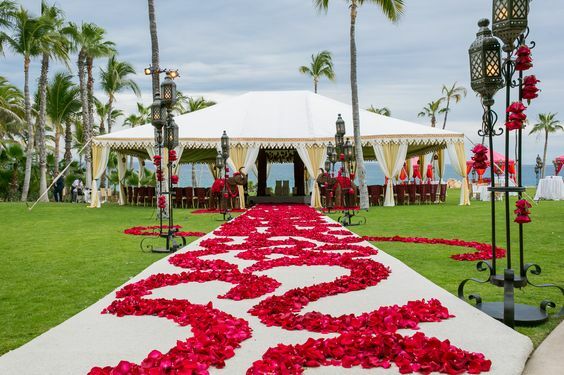 The plans called for two large tent structures, one in the front where guests and groom's family were welcomed for breakfast and one in the back of the house where ceremony was going to take place. Another challenge on hand was to do a quick turn around for luncheon reception after the ceremony. Our colors for the front tent were coral and ivory with minimal decor. Once the tent was up on Monday, we began to lay the subfloor which was then carpeted and by Wednesday our event started to take a definite shape. Ceremony tent was draped in silver grey fabric and three large floral chandeliers were hung above. The tent had cutout Windows and special panels were constructed to make it look like a " finished room". Flowers were in peach and ivory. 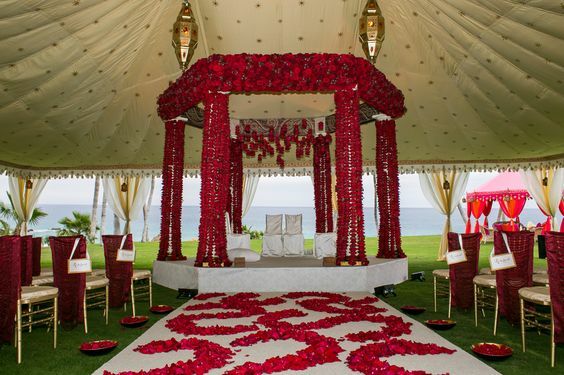 Since this was a Sikh wedding, a beautiful backdrop of orchids and roses was designed to go behind the holy book stage. This backdrop was to later be behind the sweetheart table. An elegant aisle awaited in the middle of the tent for the bride to make her entrance on her father's arms and large floor pillows in wedding colors were placed all over the space. On Wednesday and Thursday, we were shuttling between Sangeet and wedding venues which were about an hour apart so needless to say it was very challenging and hectic. Friday was mostly dedicated to setting tables for lunch and placing them behind the tent so we could bring these pre set tables for lunch during our turn around. Late Friday night all the floral chandeliers were hung on the ceiling and the entrance arch to ceremony site was installed. Saturday morning was a very early day since the Baraat and guests were expected to arrive at 9 am. We got to the venue with our entire team at 6 am to fine tune details and go over the time line with wait staff, valet and our own staff. Our front tent was all ready with food by 10 am. Baraat started at 8:30 am and guests made their way in to the tent by 10 am where a hot breakfast awaited them. By 11 am guests were making their way to the back tent for Sikh ceremony which is supposed to conclude by 12 pm. After receiving cold hand towels which had been soaked in rose water over night and kept in the refrigerator, guests proceeded to take their shoes off and entered the ceremony tent. Bride made her entrance at 11:30 with her father and was escorted to the front to take her seat next to her husband to be. Ceremony concluded at 12 pm and our couple was whisked away by the photographer for pictures. As soon as guests made their way to the front tent for snacks the entire production team frantically went to work for a quick turn around for lunch. Couple's stage and backdrop was ready in no time and we all managed to bring and set all thirty tables in less than an hour. Florist was busy placing center pieces and fine tuning details. Servers were busy pouring water and specialty drinks and setting cold soup on each place setting. Our jazz quartet was in place playing beautiful tunes. We approached the client and informed them of tent being ready. Guests were thrilled and amazed to see the quick transformation. Couple made their entrance as husband and wife and the delightful afternoon ended at 5 pm when the bride said emotional goodbyes to the family. It was indeed a long and fruitful day! 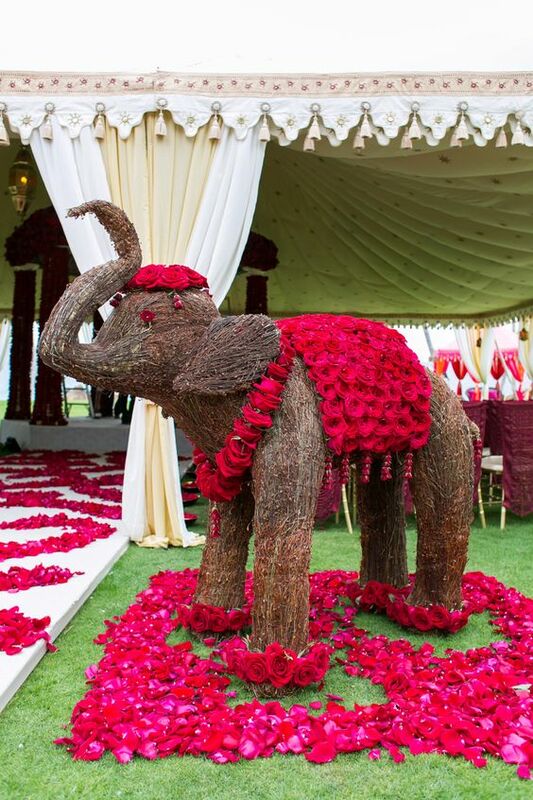 Our clients vision for the Sangeet for their daughter's pre wedding event was to create "Delhi Farm House". The venue that was chosen for this event was very much in sync with the client's vision since it is a large garden that has unlimited potential. After a couple of comprehensive site visits with the production team, and clients final approval on the floor plan, color palette of burgundy and deep purple was decided. These colors were further going to be enhanced by deep orange in flowers. Our plans called for a huge truss structure around the perimeter which could comfortably accommodate over 400 plus guests. 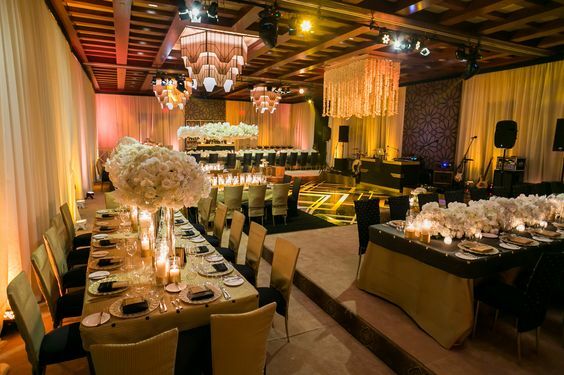 The truss was covered and draped in deep burgundy chiffon with multiple hanging chandeliers and lanterns. Two large custom bars that were both 12 ft long and were painted in burgundy and gold enhanced the ambiance with perfectly paired gold bar backs. Since this event was to have a more casual and fluid feel, we brought in a lot of lounge furniture covered in our two main colors and spread it around. The focal point was the 60ft wall that was the first visual as guests entered the space. The video mapping was projecting images of old historical. Luciano's and farm house weddings in India and was adding a lot of interest and movement. A beautiful round Merlot dance floor was set in front of the wall with chandeliers and hanging garlands of marigolds above. As guests valet parked and walked on the red carpet there was an impressive entrance made with hundreds of marigolds. The concrete area which led to the garden was embellished with string lights and lanterns and lighting projections which further enhanced the mood. At the entrance of the garden, there was another marigold arch entrance with lanterns and laser cut panels with marigolds which were carried above the dance floor, bars and entrance structure. Tons of candles and dramatic lighting created a romantic and colorful ambiance. After the groom's family's arrival the bride had a special surprise dance prepared for the groom which led to opening the dance floor. The DJ who was flown from India kept the guests busy with upbeat Bollywood songs. Multiple food stations from various regions of India, seafood bar, Asian fare and wide array of desserts stayed open all night so guests could eat any time. Since the client is a wine connoisseur, many specialty wines as well as spirits were provided for guests enjoyment. This event concluded at 3 am and we were thankful of the fact there was one day in between for us to get ready for the big day. Our second event was Sangeet which is essentially a big night of food, music and dancing! This event typically lasts till the wee hours of morning and is very high energy. For this event we had decided on deep red color palette with hint of aubergine. 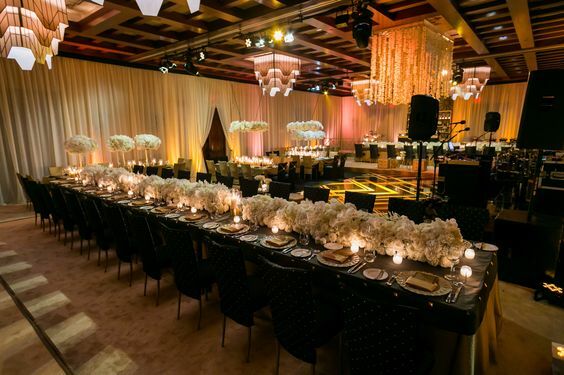 The idea was to have this event in two phases starting with dinner and some family dances in the lower level and later escorting guests to the after party and desserts upstairs. Since the temperature was balmy and comfortable this week, guests were having a fantastic time being outdoors on the terrace. We had set two large bars to keep guests happy and the entire space was set up with multiple food stations spread throughout the terrace. Decor consisted of lounge furniture in merlot and red tones along with tables of different configurations. 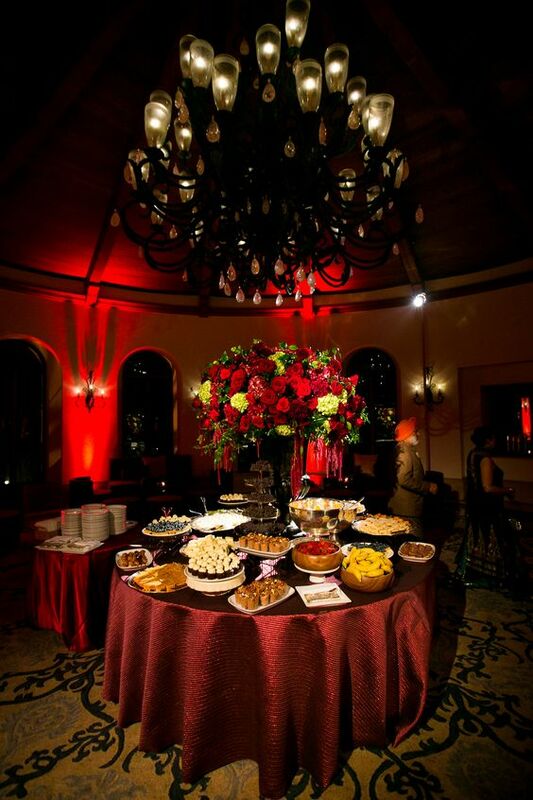 Beautiful custom linens and flowers complimented the decor in shades of red and the vibe was sensual and elegant. Our couple made their dramatic entrance from the impressive staircase of Bacara and made their way down accompanied by the bridal party. Bride and Groom's families and friends did a few choreographed dances followed by skits by groom's friends and dance floor was opened for guests to do justice to. Festive feel of the event coupled with delicious cuisine prepared by the hotel and the Indian caterer who was brought to the venue by the client created amazing ambiance. There was a lot of movement, fluidity, laughter and good energy in the air and the night was absolutely magical. At 10 pm guests were escorted to the sounds of drums to the upper level.